This content is © Dale Fisher Photo | All rights reserved. Art is THE gift that is appreciated EVERYDAY! Within the Dale Fisher Galleries walls and archives are photographs of; University of Michigan Hospital, Campus, Sports & Stadium, lots of lakes, freighters, trees, landscapes, wildlife; as well as the Cities of Detroit, Ann Arbor, and Counties of Jackson, Washtenaw,…. Every time I look through Dale Fisher’s photographs, I find more beautiful images that should be shared, seen and appreciated. This beautiful “Winter Deer” photograph has been hanging in our gallery reception hall. It is definitely a classic! At our “Black Friday Sale” our very first bride stopped in. Ten years ago, her wedding was held at the edge of the woods. The pergola had not been built, but “Winter Deer” was in the background of many of her reception photographs. She loved the photograph very much and would love to have it hanging in their home. She was thought it would be the perfect gift from her husband…. THEN… as I was reviewing our archives I came across this photograph and knew I had to post… Hopefully, I can get it uploaded to be purchased… If you can’t wait… just call. We do offer gift certificates or you are welcome to tour our galleries. We are open by appointment so feel free to call. 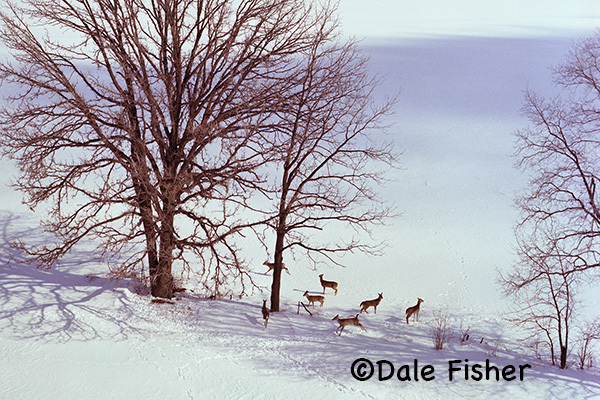 Enter your email address to subscribe to Dale Fisher Photo and receive notifications of new posts by email.